The exhibition featured two artists, Lun*na Menoh and Adam Lee Miller, who were invited to Japan for the C.A.J. Artist in Residence program. Menoh is an artist residing in Los Angeles. Her activities include sewing and clothing in various genres; installations, fashion shows, the "Sewing Sisters" band, and visual art. 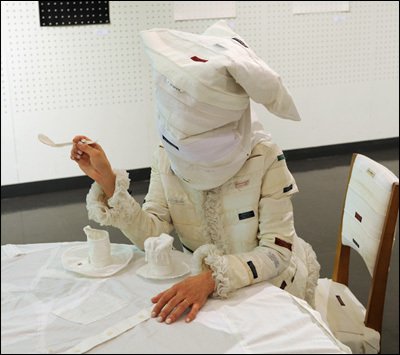 There she has been continuously presenting her works using the collars of dress shirts stained with sweat. The artist says that stains on dress shirts symbolize the labor of men and the history of housewives that struggled to remove it in one way or another. 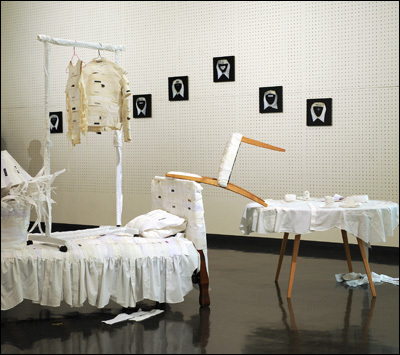 In the exhibition, Menoh created an installation using abundant collars to cover up the furniture such as a bed, sofa, and table. 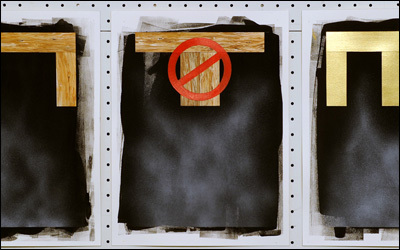 In her work, the sweat stains are a metaphor for contemporary society formed by white-collared workers who provide labor while being dominant in the hierarchy. At the same time they are evidence of a choker ring leashing men to society. Meanwhile, men reflect their compensation, the measure of their effort and achievement, on the furniture in their house and act proudly or sometimes oppressively in the family system as the breadwinner. In this androcentric world, women try to seize the initiative in the household while keeping their houses as dutiful housewives. Sewing machines for sewing dress shirts is a symbol of the labor done by women in their home. In other words, households have been a place of struggle for gender relations. However, in Menoh's work, the collars and sewing machine seem to have met to attempt a reconciliation after a conflict. Miller is an artist from Detroit. He works in various areas; film, painting, and music. Of special note is his unique musical unit “ADULT.” with which he has worked on energetically from 1997 with Nicola Kuperus. Their film is somewhere in-between a music video or movie, refusing to be categorized as either one of them. They do everything to create the content, from the stage sets to film direction, to insert only their own interests and feelings. Moreover, they show the film only in their live shows. For this exhibition, Miller presented his drawings and paintings created in Japan. 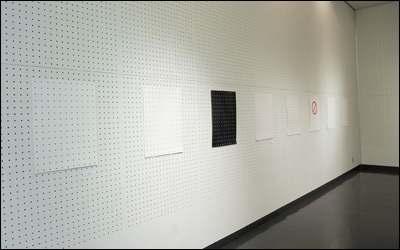 A drawing which imitated the perforated wall of the gallery remembers us of Damian Hurst using dots as his motif, Roy Richtenstein, and Yayoi Kusama. He says that he gets his idea from the elements of space and architecture for he often works at a construction site. The paintings were also based on his interest in space. They humorously presented how the world changes by shifting and　displacing your position. The commonality of the two artists is that they change their medium freely for what they want to express. It is a difficult approach since it requires various techniques and an understanding of each medium. Instead, it enables the artists to freely express themselves. Though the interests of the artists are different, both are attempting to interpret the world through their motifs such as sweat-stained collars and architectural spaces. Their works proved the possibility of art, the imagination and sense of adventure to seek the truth from fragments of the world.